Wow, this foldable electric 3-wheel scooter looks awesome and innovative that reminds me of the Piaggio 3 wheel scooter but for standing! I got excited when saw a lightweight and compact personal mobility ‘Transboard’. No looks super chunky, like carrying around a piece of wheeled luggage. 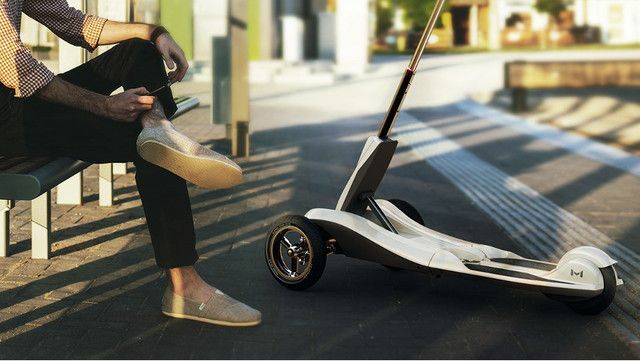 Mercane launches a new version of the Transboard, an advanced, eco-friendly electric ‘kickscooter’ that combines speed, stability, and safety to give a user superior riding experience. 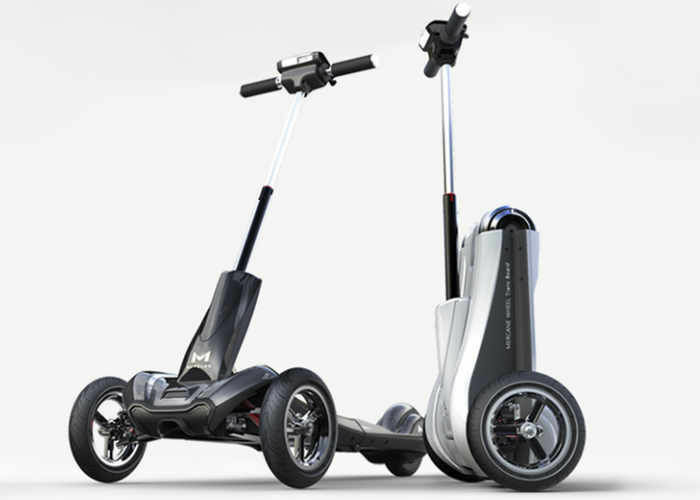 The Transboard offers users best-in-class driving stability and performance with its3-wheel self-balancing system. Its double wishbone suspension is installed in rev-tricycle type Transboard helps the driver to drive safe and more comfortable even over uneven terrain. A special self-folding system of the Transboard transforms it into a travel carrier with a simple hand flip. Its high-performance 48V 500W BLDC HUB motor delivers a top speed of 22 miles per hour and can climb hills up to 15 degrees. The die-cast CNC process provides the sturdiness to its frame and its high gloss beautiful color stylish lines you’ll find in the sleek body of a car. It can carry up to 220 lbs (100kg) easily and safely. It has a LED screen that displays speed, distance, power measurements, and other important functions. Using five buttons on the bottom of the display, you can power up your Transboard, set your trip distance, and change the display mode. Its detachable battery enables you to charge it anywhere separately from the scooter itself and goes up to 25 miles on a single 6-hour charge. "The vast majority of scooters on the market today are outfitted with just two wheels in order to keep them compact and ensure versatility. Transboard has three wheels and a more balanced design so riders won't have to constantly find their balance - this means a more safe, more comfortable ride for extended periods of time! ", said Mark Min, CEO, Mercane Wheels. The Indiegogo campaign which has a funding goal of $30,000 USD, features limited Early Bird specials of $499.00 USD (60% off retail) and several other rewards for early backers. Transboard, currently available in the black and white models, is perfect for work, play or anywhere you need to get places quickly and in style along with cutting edge technology making for a more comfortable & safe ride in an urban or rural environment. The company also has an interesting eWagon concept, a foldable, electric-powered, remote-control-capable wagon which can carry both the adult driver and some amount of cargo – even, possibly, a child or two in the wagon portion.